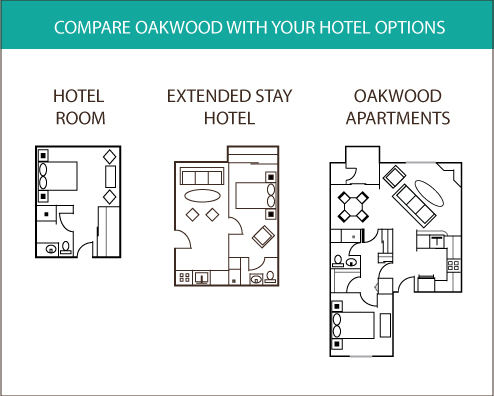 When you want the space to work or relax, nothing beats an Oakwood apartment. Compare our floor plan to a typical hotel room, and imagine the comfort and convenience of having separate living and sleeping quarters, plus a fully appointed kitchen at your fingertips. To search Oakwood properties in the United States or Canada, use our Find & Reserve tool. To discuss how we can help you, call us toll-free at 1.877.902.0832. Outside the United States and Canada please dial 1.602.427.2781. Or, email us for assistance with your temporary housing needs.